Mike Manzoni reports from Pelham, N.H., where police are asking for help finding out who filled some roads in town with nails. 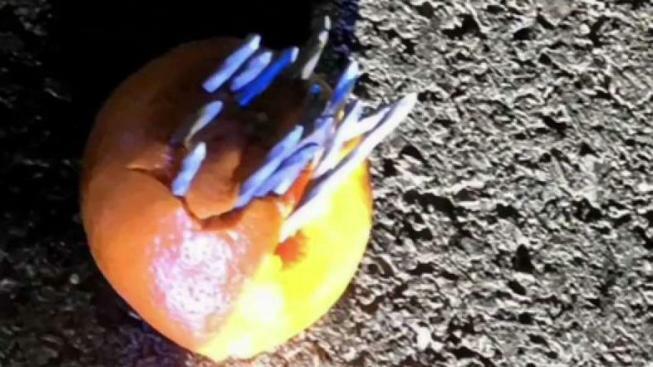 Police in Pelham, New Hampshire are searching for at least one suspect after several oranges and other objects loaded with nails were found along Nashua Road on Sunday night. The nails, which ended up giving one driver a flat tire, were embedded into oranges and strips of cardboard. Police said they suspect a teenager — or teenagers — are likely responsible for the stunt. Police said the suspect — or suspects — could face criminal charges.